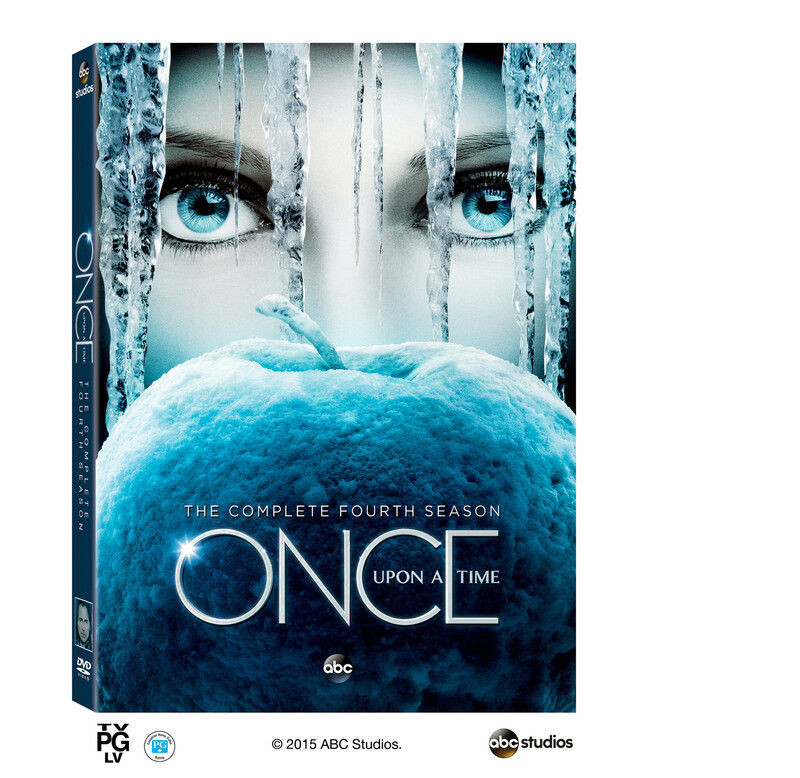 You can bring home the magic of Storybrooke with Once Upon a Time season 4 on DVD and Blu-ray! Pre-order NOW from the following retailers and get the incredible fourth season of TV's most magical drama when it releases Tuesday, August 11th! "For us, that’s what a fairy tale is. It’s that ability to think your life will get better. It’s why you buy a lottery ticket—because if you win you get to tell your boss that you’re quitting and you get to move to Paris or wherever and be who you always wanted to be. And that’s Cinderella, right? One day she’s sweeping up and the next she’s going to the ball. Adam and I just wanted to write about something hopeful that for one hour a week allows one to put everything aside and have that feeling that your dreams just may come true." About Season 4: After defeating Zelena — the Wicked Witch of the West — Emma (Jennifer Morrison) and Hook (Colin O'Donoghue) were pulled into her time portal, which brought them back to the Enchanted Forest of the past. When they accidentally thwarted the initial meeting of Snow White (Ginnifer Goodwin) and Prince Charming (Josh Dallas), Emma and Hook had to find a way to fix the timeline and get them together, or risk altering their futures and possibly obliterating Emma and Henry's (Jared Gilmore) existence; not an easy task to undertake. When Emma was captured by The Evil Queen (Lana Parilla), she met a female prisoner scheduled to be executed. Upon finding a way to escape, Emma saved the prisoner's life by taking her along. But Hook believed the woman's fate was to die and feared that things could be altered by her continued existence. After successfully getting her parents back on track, Emma, Hook and the prisoner found themselves captured by Rumplestiltskin (Robert Carlyle) and imprisoned in a room that contained his most unpredictable magic. With no way to escape, Emma discovered that her own magic had returned, and she was able to whisk herself, Hook and the prisoner back to present day Storybrooke. Upon their joyous return, Emma learned that the prisoner was none other than Robin Hood's wife, Marian, who was presumed dead in the previous timeline. Regina and Robin Hood had begun to fall madly in love with one another, but with Marian's return, their relationship could be in danger. And, unbeknownst to anyone, Emma and Hook also brought back Elsa. The Storybrooke residents do not know what Elsa has in store for them. Back in the past, in Elsa's kingdom of Arendelle, we will discover what happened to her, her sister Anna and Kristoff, and how and why Elsa became a prisoner of Rumplestiltskin. And now that Emma has brought back Robin Hood's wife, Marian, and possibly sparked the end of Regina's relationship with him, will she return to her old, evil ways and do everything in her power to get even? And newlyweds Belle (Emilie de Ravin) and Rumplestiltskin continue to be deeply in love with each other. But Rumple is hiding a secret from Belle -- one that, if found out, could destroy their happiness - he continues to be the master of the dagger that calls upon him to be the Dark One. Can Emma and Hook commit to one another, and can these two damaged people take their love to the next level? Mary Margaret and David have a new baby, Prince Neal, and are looking forward to raising him into a proud, brave and loving adult. But they are still sad that they were not able to do this with Emma, instead helping her escape the curse when she was first born and not meeting her again until she was 28 years old. Henry is very happy to have both of his mothers back in Storybrooke. But with biological mom Emma and paternal grandfather Rumplestiltskin's blood running through his veins, he will be tested by both the light and the darkness. Finally, Will Scarlet (Michael Socha), a former member of Robin Hood's band of Merry Men, has traveled across many lands to make his way to Storybrooke. He finds himself intertwined in the goings-on in town for the first time as his mysterious past pushes him to an unknown future. For detailed recaps please visit Once Upon a Time's Season 4 Episode Guide. Check out this teaser for Season 5 and tune in to the premiere SUNDAY, SEPTEMBER 27 8|7c. First Look: Emma as the Dark One|Catch a glimpse at Emma as the Dark One!|In a prison located in the Enchanted Forest, a servant comes to give supper to a lone inmate: the Dark Swan. Her captor is surprised to see that monster Emma is a beautiful woman... until she grabs his heart and crushes it. Watch Once Upon a Time SUNDAYS 8|7c on ABC. WATCH: Get a first look glimpse at Emma Swan as the Dark One.